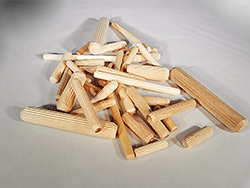 Now available in convenient bags of 100 in the most popular sizes of pre-glued birch fluted dowel pins. Pre-glued dowel pins bring remarkable convenience as they provide quick and easy joining without additional glue. Remember to increase your diameter tolerances for width of the glue by about 0.1 or 0.2mm. Availability? 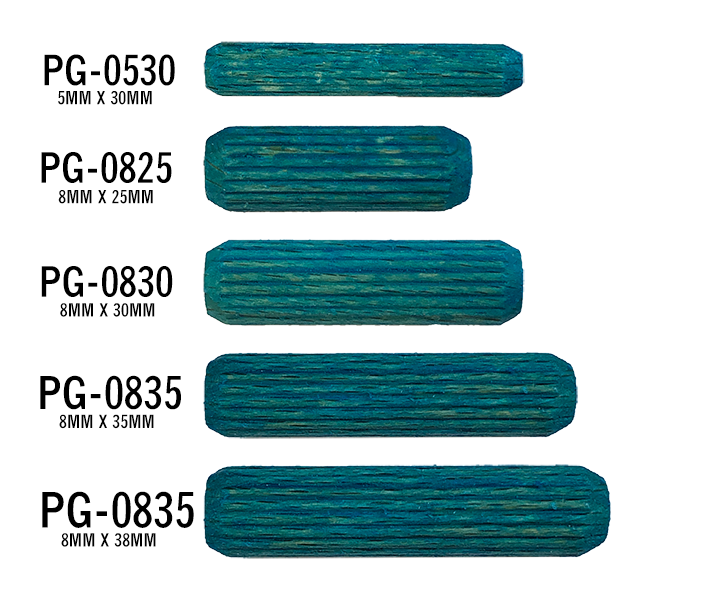 We can supply pre-glued dowel pins in metric and fractional sizes in both spiral-grooved and multi-grooved (also known as fluted) dowel pin types for use in various woodworking applications. How do pre-glued dowel pins work? 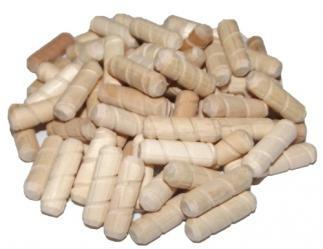 Pre-glued dowel pins are coated with a Type 1 re-moisturizing PVA wood glue that is water activated. Benefits: Replace your wood glue with water to activate the glue on the pre-glued dowel pins. Benefit from 100% glue coverage for superior holding strength. You can likely realize significant savings and increased production as you eliminate production stoppages caused by glue buildup and squeeze out. Looking for quantities right now of 1000 or more in a particular size? We can help! Just Contact Us for a quotation and we'll be sure to get you excellent pricing. Are Plain or Pre-Glued Dowels better? A proper diameter dowel, in a proper diameter hole, applied by an automatic machine will produce a stronger joint with a pre-glued dowel than with conventional dowels and glue. This occurs because glue applied by an automatic machine does not coat the entire circumference of the hole, compared to water which tends to completely coat the hole due to its lower viscosity. Anytime an improper fit occurs because of the dowel or the boring, a conventional dowel and glue will produce a stronger joint. The primary reason is because a pre-glued dowel will not fill any voids. Will Pre-Glued Dowels or water damage our panels? Pre-Glued Dowels and water can damage panels if they are not used properly. Generally, the problem does not manifest itself in solid wood. You are more likely to see it in plywood panels. If the depth of the hole and the length of the dowel are proper, then there is no void left to trap water. If holes are drilled deeper than necessary, a place is provided to trap water. This water may then bleed through to the surface. To prevent this possible occurrence, only two things are necessary: proper hole depth and proper dowel length. If used properly, you should not experience any discoloration problems. 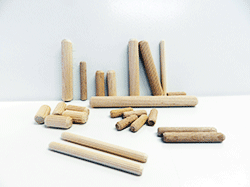 What pressure is required for Plain and Pre-Glued Dowel Pins? Generally, 10-20 psi is all that is needed for water to activate Pre-Glued Dowels. If you have been using glue, you may need to decrease the time that the glue valve is open to avoid injecting too much water into the hole. When using plain dowel pins, a good rule of thumb with glue is the higher the pressure the better. Higher pressures will help the glue nozzles clean themselves. When they are kept clean, they will perform much better. Please keep in mind that these are general rules of thumb and that specific applications need to be addressed on an individual basis. 1. Clean and drain all glue from glue system and inserting nozzle. (It is recommended that you clean lines with hot water to thoroughly flush out all glue). 2. Replace glue with water and lower pot pressure to between 10-20 psi to compensate for water viscosity. 3. Fill hopper with pre-glued dowel pins and begin. Manual Insertion: The most common water application methods are: a spray mist bottle, a standard squeeze bottle and a pressure pot system. 1. Spray mist bottle: adjust the nozzle to a fine mist. Spray once or twice directly into the hole and then insert the dowel. 2. Standard squeeze bottle: fill hole approximately 1/3 with water and then insert the dowel. 3. Pressure pot system: lower the pot pressure to between 10-20 psi and adjust the gun nozzle to a short open time. Fill hole approximately 1/3 with water and then insert the dowel. Note: Glue may be used in conjunction with the Pre-Glued Dowel Pin. This is typically done when gluing side panels or short depth applications.